The Birmingham Bar is very highly recommended by police and security specialists to strengthen a door frame against 'kick-in' attack. It is a dual purpose flat security bar mainly used to strengthen the hinge side of the door frame on inward opening doors. If only mortice locks are fitted to the door (ie. there is no rim lock staple on the frame), the Birmingham Bar is also used to strengthen the frame on the locking part side. 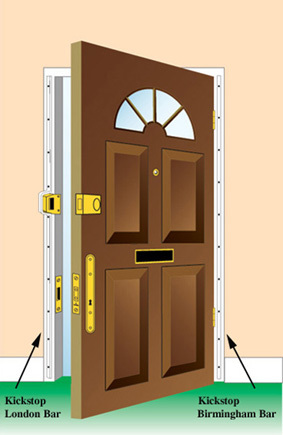 On an outward opening door it can be used on the external face of the door frame on both sides. It will then resist chisel or jemmy attack to the frame but must be fitted using security screws or bolts. A packet of 2 1/2" No. 10 woodscrews is supplied. If theses screws are used to fix the bar externally (as an alternative to using security screws) we suggest that the screw heads are burred over (after final fixing), to help prevent unauthorised removal.